Cecile's Florentines are a Kraft Kitchens classic. This recipe is a Christmas favourite that's perfect for gift-giving (if you can bear to part with these delectable cookies!). Combine all ingredients except chocolate. Drop teaspoonfuls of dough, 2 inches apart, onto greased and lightly floured baking sheets. Bake 10 to 12 min. or until edges are lightly browned. Cool on baking sheets 3 min. Remove to wire racks; cool completely. 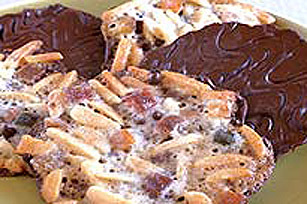 Melt chocolate as directed on package; spread onto bottoms of cookies. Run tines of fork over chocolate. Let stand, chocolate-sides up, until chocolate is firm. Store cookies in tightly covered container in refrigerator.